At 21:00 on a Tuesday, my phone rang and on the other end of the line was Jeremy Clarkson attempting to tweet a video he'd recorded a few minutes earlier. After 30 seconds or so of attempting to understand why he was asking, the premise became very clear. He and James were in London Heathrow, on their way to Sydney for Top Gear Festival. 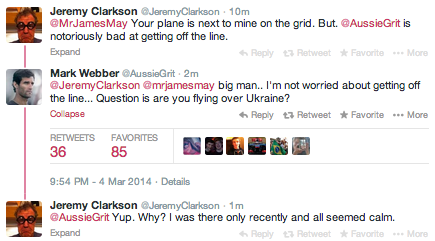 However, unusually, they were not on the same flight - Jeremy flying via Singapore and James via Dubai. 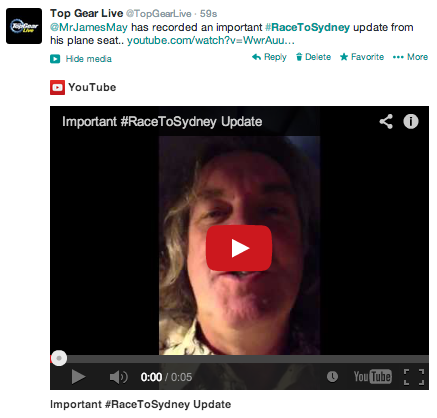 What followed was a 24hr live video-tweeting 'Top Gear race' with videos being emailed through the night and coordination if their publication through social media involving celebrities including Mark Webber, Richard Hammond and Shane Jacobson. In all the campaign amassed over 40,000 views on YouTube collectively in the space of 24hrs, with over 1,200 new channel subscriptions. With Jeremy Tweeting flight numbers to his followers, it allowed people to track the 'race' via flight scanners. Within an hour, FlightRadar24 picked up on the story and shared links to the respective flights to their 80,000+ followers. NB: In 2014, tweeting videos was not possible. They needed to be linked to external video hosts.